London was the biggest and most important city during the Medieval times and era. The Medieval London Guilds played a major role in the lives of the people in the city. The members of the Medieval Guilds became powerful. The Guilds controlled the way in which trade was conducted in the town. The members of the Guilds also became involved with civic duties and were appointed to important and influential positions in the community. The guilds effectively ran the city and controlled commerce. Each guild had its own hall and their own coat of arms, but there was also the Guildhall (1411-1440) where representatives of all the various London guilds met together. The word “guild” derives from the Saxon “gilden” meaning "to pay" and refers to the subscription paid to the Guilds by their members. Other words associated with the term guild include association, society, brotherhood, company, fellowship, fraternity and livery. It is interesting to note that many of the streets in London were named after the particular trade which practiced there. These names have survived to the modern day and include names such as Bread Street, Mlk Street, Pudding Lane and Threadneedle Street. The major towns of Medieval England had a guildhall. A Guildhall is a building historically used by guilds for meetings. A deed of 1369 refers to the "gildaule", and a charter of 1439 states that "pleas happening in the said borough...shall be pleaded and holden in the guildhall there, before the mayor and bailiffs for the time being". The name for guildhall occurs in early records as "Gialle," "Gihalle," "Guyhalle," "Gihale," "Guihalle," "Gyhale," "Gilda Aula," "Gildaula," "Gyhalda," and "Gildaule" and is derived from "gild " meaning payment or "gildan" meaning to pay. The Guildhall would be the appointed place where the burgesses would "yield" or pay their taxes, hence another name for Guildhall - "Yeldehall". The purpose of the Guildhall building was to conduct the commercial business of the Guilds. It was also used for the civic and administrative duties of the guilds and its members including the mayor who also held the post of chief magistrate in the later period of the Middle Ages. The great hall of the London Guildhall was second in size only to that of the king's hall at Westminster. The mayor of London even sat on a dais as the king did in his hall. The Medieval Guilds of London had their own Ceremonial Livery. The formal name for the London Guilds are livery companies. This referred to the elegant apparel, called livery, that Medieval London guild members wore on special and ceremonial occasions. 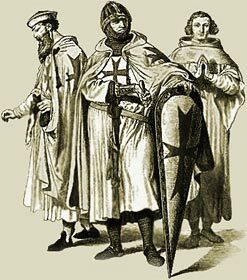 The livery clothing was adopted by the Medieval London guilds in the reign of King Edward III (1312 - 1377). The clothes, or livery, worn by the guild merchants were extremely important as they identified the merchants with a specific guild and distinguished their members from one another. The Guild merchants wore their livery when they marched in parades and processions and attended ceremonies and other Royal gatherings during the Medieval times and era. There were women in Medieval Guilds. A law called 'femme sole' allowed women to trade in their own right in the case of a widow continuing her husband's craft. The whole family were involved in the Craft Guilds helping the craft guild member who was the head of the family. A wife, daughter or son would work accordingly in the trade of the family. Women were therefore able to take over the trade upon the death of a husband. Candle makers were called Chandlers in the Medieval times of the Middle Ages. there were two types of candle making guilds - the Wax candle makers and the tallow candle makers. The tallow candle makers were made with animal fat and therefore closely associated with butchers or skinners. The tallow candle makers also became soapmakers, although it is unclear whether there was a seperate medieval ages soapmakers guild. The Tallow candles were much cheaper, leading to chandlers laws being passed regulating the percentage of a candle which could be tallow. Rich people used the wax candles and poor people used the tallow candles. The wax candle makers, made predominantly from beeswax, were often quite wealthy due to the constant demand for their product. The church was one of their best customers. The incidence of widows taking over the family business and access to the Candle making guilds was high due to the profits made in such a business. The Medieval Times website provides interesting facts, history and information about these great people and important historical events which scatter the Medieval History books including Medieval London Guilds. The Medieval Times Sitemap provides full details of all of the information and facts about the fascinating subject of the lives of the people who lived during the historical period of the Middle Ages. The content of this article on Medieval life and times provides free educational details, facts and information for reference and research for schools, colleges and homework for history courses and history coursework.